Unlike chickens and some other animals, I was raised that there are milk cows and there are meat cows. We had Jerseys to milk and red and black Angus for meat. Where I came from, there really weren’t many cows in that area that were good for both meat and milk. Now that I’m out of the little town that I was raised in, I realize that there is a whole wide world of cows out there that are great for using for both milk and meat. Since we’re the kings and queens of multi-purpose living, and most of us don’t have a ton of space to have several of each type of cow, we need to cull the herd a bit. See what I did there? My goal over the next few paragraphs is to lay out some options for you so that you can have the best of both worlds. Before we get into actual breeds, know that as a small homesteader, a lesser-known, miniature breed may be better for your needs than a mainstream cow because they’re often bred for one trait or another. They may also be bred to live a commercial lifestyle, thriving on grain and hay rather than foraging. In short, they may be less hardy, and therefore less suitable for a sustainable situation that requires low-maintenance animals. In short, we don’t want picky cattle that cost a fortune to feed and don’t meet our needs. We need a cow that breeds easily, because we want more meat and more milk. An open (non-bred, without a calf) cow is a cow that isn’t earning her keep in any way, and that won’t do. So what if she gives a ton of milk and produces a big, beefy calf when she calves if she doesn’t breed consistently? What I’m saying is that what commercial farmers value in a cow may not necessarily be what we value. Remember, they value volume. They want a cow that gives a ridiculous amount of milk regardless of whether she needs expensive feeds and supplements to do so. We want a cow that provides a decent, constant supply of milk without needing expensive feed. After all, what would we seriously do with five or six gallons of milk per day per cow? So, who cares what Big Ag says is the best cow? As usual, what’s good for them isn’t necessarily what’s good for us. I’ve done quite a bit of research lately and have come to the conclusion that the miniature cow route may be the route to go for us little guys. Adequate milk and meat for our needs, half the feed, and half the space; it’s a great idea. If you’re looking for a full-sized cow though, these first two may be good for you. These cattle were originally tri-purpose: milk, meat, and draft work. They’re thought to be the first English breed to be imported to the states in colonial times. There’s a farm called Flack Family Farm in Vermont ran by Doug Flack and his family that raise these cows, and they sound like the perfect cow for what we need. They’re a smaller breed, with three-year-old steers weighing in at 600-750 pounds, hanging. They’re also hardy and do well in hot climates, but do fine in the cold, too – obviously, because these cows are in Vermont! The cows give 35-40 (5 gallons or so) pounds of high butterfat milk per day while living on wild pastures (clover, orchard, bluegrass, and vetch) with no grain supplementation. Wow, this cow is sounding great! His cows lactate from mid-May to early November and are milked twice a day in the spring and once in late summer and fall. And how about longevity? According to the interview I read, he has a 14 year old cow that’s still lactating! Regarding cheese, the average milk cow milk converts about 10 percent of their fluid milk to cheese, but the Milking Devon can convert almost twice that. That’s a crazy big deal. The meat is beautifully marbled and is purportedly just as good or better than traditional meat cattle, and the steers are raised on pasture. This is a great way to have a cow that feeds your family and provides a dual source of income to help support your farm. 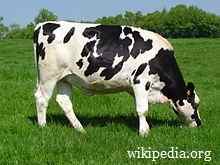 A Holstein is a mainstream cow that’s a great balance of milk and meat. Be warned: she’s considered a milk cow and is the top-producing milk cow in the industry. Expect up to nine gallons of milk a day. This may be good if you only want to keep two cows (in case one doesn’t breed one year). Still, that’s a LOT of milk, but you’ll have plenty of friends, and you can always can it. The meat is said to be good, and since the Holstein is a large breed, you won’t need to raise more than one or two calves a year for meat. A note though – they eat a ton! Apparently, they aren’t great at converting feed to meat, so they require 10-12 percent more feel than the average beef cow, or milk cow for that matter. Still, I wanted to throw them in the hat because they’re easy to come by and do produce plenty of milk and meat. There is a miniature version of them, but apparently the cute factor comes into play when contemplating eating them. It’s an option, though. This miniature cow is a cross between some of the best of both worlds. It’s a 50-50 cross of a small Irish Dexter beef cow and a Jersey milk cow. The idea was to add some of the delicious butterfat of the Jersey, but to use the Dexter to pack some meat on its bony frame. Oh, and to take away the meanness of the Jersey bull. It worked; the result is a cow that gives good meat and milk and is docile, with even the bulls exhibiting little to no aggression. The Belfair produces about three gallons of high butterfat milk per day and beef up quickly at around four months. The breed is small so it has a smaller appetite. 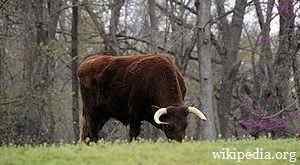 Actually, it’s been called the poor man’s cow because it produces milk and gains weight on inferior pasture. Nothing high-maintenance about these cows. 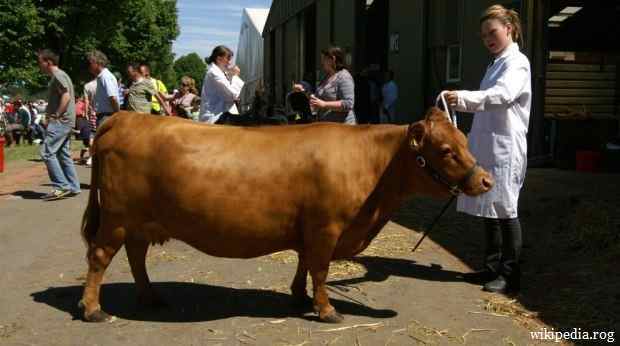 The Belfair looks like a beefy Jersey cow; blacks and browns ranging from mahogany to dun. Sometimes, there will be some white, and the cow has horns, The cow is 42-46 inches at the shoulder and is actually considered a mid-sized miniature breed for registration purposes, formally known as the Belmont. Why Go with Miniature Cows? We just talked about the Belfair, which is a miniature cow breed, as is the Dexter, and the more I research, the more I think that miniature cows are worth looking at for those of us with little space to dedicate to cattle. I’ve also noticed that there’s a good selection of dual-purpose cows in the miniature pool. They were pretty much bred to suit our needs. That puts them at one-third to one-half the size of a regular cow. As a life-long farm girl, I have to say that this is an appealing idea, because, if for no other reason, they make smaller piles and would be easier to manage physically, especially for those of you new to milking. There’s nothing to make you grouchy faster than getting shoved out of the way by a 1000-lb animal when it’s 30 degrees and muddy. They won’t drown you in milk, but you won’t run out, either. A mini cow will give you a gallon or a gallon and a half per day, more than enough for milk and butter. They’re 25-30 percent more feed-efficient and require about a third of what a regular cow eats. You’ll buy less and haul less. There are a few good dual breeds out there, in addition to the Belfair. The Zefu gives about a gallon of high butterfat milk per day, but from all accounts, you may have trouble butchering them for meat because it would be akin to eating the family dog since they’re so friendly. 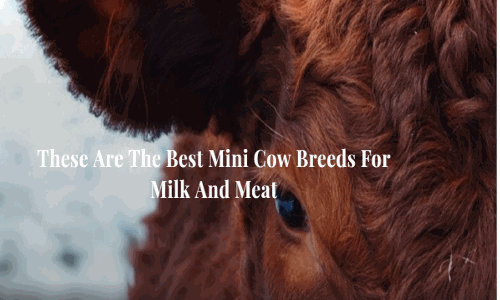 Miniature cow breeds are certainly an attractive option for small homesteaders for all of the reasons that we’ve discussed. They’re widely available, but appear to be kind of regional, so what’s available in one part of the country may not be available in another. It’s an intriguing proposition – all of the benefits of having a cow with half of the downfalls, or maybe a third! If you have any experience with miniature cows, or have a suggestion for a good dual-purpose cow of any size, please share with us in the comments section below. Also, if you’d like to learn how to tan your hides, butcher your meat, can your milk, make butter, or can your beef, take a look at my book, Forgotten Lessons of Yesterday. I’ve compiled a ton of useful, diverse information so that you have it right at your fingertips, plus there are five free guides that are valuable in their own rights. Check it out!